Tell students that this is the third activity of their competition. The group that does the best job will earn five points. Remind students of which groups they are in. Give each student four different colored pieces of paper: one for opioids, one for CNS depressants, one for stimulants, and one for inhalants. Students should label each accordingly. Read each of the statements below. Pause after reading each statement and tell the students to pick the colored paper (drug) that the statement describes and to hold it up. Create your own set of paper to hold up the correct answer(s) for students to see after they have made their own selection(s). Warn students that sometimes they may have to hold up more than one colored piece of paper. Tell the students that if they hold up a paper with the wrong color, they will be out of the game. The game will continue until only one student is left or until all the statements have been read. If only one student is left, that student’s team earns five points. If several students are left, each student earns one point for his or her team. When the game is over, record the winning group’s points on the Group Scorecard. These drugs should only be used when directed by a doctor. People should never use these drugs for anything other than their intended purposes. These drugs can cause addiction if used inappropriately. These drugs can cause death if used inappropriately. This group of drugs is prescribed to relieve severe pain. When one of these drugs is inhaled, it can cause sudden sniffing death. These drugs are prescribed to patients with attention-deficit hyperactivity disorder (ADHD). When used inappropriately, this group of drugs can cause seizures. When used appropriately, this group of drugs causes calmness and helps with sleep and anxiety problems by increasing the release of the neurotransmitter GABA. When used appropriately, this group of drugs causes alertness by copying the activity of the neurotransmitters dopamine and norepinephrine. This type of prescription drug affects the neurotransmitter dopamine. This group of drugs can deprive the brain of oxygen and decrease coordination. When abused, these drugs can cause heart and breathing problems. Public Service Announcements, or PSAs, are run on TV and radio to inform the community about safety and health information. Tell the students that they will be planning, writing, and performing their own PSA for the class. Divide students into groups of 4−6, and assign each group either “prescription drugs” or “inhalants” as their topic. Give the students about 15 minutes to look through the student magazine, their notes, and other sources to gather information concerning their assigned topic. Inform the groups that all PSAs must educate the audience on the effects these drugs have on the brain and body, and other science-based facts. Allow them another 15 minutes to plan and write their PSA; then have all groups perform their PSA. To make sure that all students in each group are actively engaged in the planning, writing, and performing of tasks, you can assign roles such as writer, director, actors, and scientific researchers. 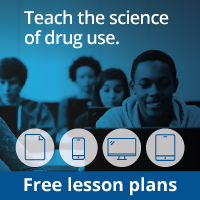 Keep the students on track by emphasizing key lecture points about the science behind drug use from the background section. Wrap up the activity with a discussion and assessment of the strengths of each group’s PSA.